When looking back on Michael Vaughan’s career, there are some of the most remarkable high points one could wish to savour. And perhaps a good job there are as well, because it puts to the back of the mind the fact that Vaughan spent a great deal of his career disappointing his many admirers and failing to reach understandably lofty expectations. When, in 1999, the then England captain Nasser Hussain rung the then Yorkshire captain David Byas to ask for his insider’s knowledge on the up-and-coming 24-year-old, Byas’ response was typically forthright and uncomplicated: “He always looks good. But he always gets out.” The words of Yorkshire’s Wisden correspondent, reporting on the 1999 season, were remarkably similar: “Always elegant but never consistent, Vaughan averaged a mere 27.12. Too often he got out to a ‘soft’ stroke before being able to show off his obvious class.” There were periods in Vaughan’s career where he broke free from this grip, but it held him vice-like for much of the time. The England captaincy (most notably during the 18 months of stunning success that spanned March 2004 to September 2005) allowed Vaughan a second string to his bow and meant his legacy will live forever – no-one will ever take from him the fact that he was the first man to lead England to 26 Test match victories – but as a batsman (his principal discipline) it is impossible to escape the conclusion that he never really came close to the sort of production that so many, all career, believed he had in him. In the late 1980s and early 1990s, massive hopes in Yorkshire were hung on an opening partnership who carried before them a great deal in age-group cricket: Anthony McGrath and Michael Paul Vaughan. The latter had already broken one age-old mould: since the beginnings of county cricket in the mid-1800s, Yorkshire had insisted that the only players eligible to play for them were those born within the county boundaries, and Vaughan’s family lived in Manchester from his birth in October 1974 to 1984, whereupon they relocated to Sheffield. The policy was, not before time, relaxed to encompass players raised inside the home-grown limits, and Vaughan was one of the first to profit, as well as induce some amount of relief in those who watched him bat that it had been. Winning the Daily Telegraph under-15 cricketer of the year award in 1990, he debuted in the first-team as the 1993 season drew to a close against Lancashire, making the joint top score in his maiden First-Class innings, 64, as Wasim Akram ran amok. Between 1994 – in which he captained England under-19s – and 1998 he did much of what could have been expected for a batsman in his teens and early 20s who was already a virtual ever-present at county level and had to play half of his matches on Headingley’s generally green seamers – he averaged 37.44 in his 89 First-Class games, opening the batting. His partner McGrath (who took longer to emerge into the first-team), however, did not, and was soon being pushed down the order, where he continued to flatter to deceive. And it was telling that whenever Vaughan stepped-up to represent England A he failed dismally – on tours of India (1994/95) and Australia (1996/97) and at home in invitational fixtures, where his 8 games produced a scarcely believable average of 7.50. Equally telling was his failure to master the art of batting in the shorter game, something he was never to manage all career. Vaughan’s career hit a stumbling block in that aforementioned 1999 season. In 1998/99 he finally managed some success for England A in Zimbabwe and South Africa, and by then at the sort of age where he might reasonably have been expected to have kicked-on and demonstrated the sort of prolific form everyone had always believed him capable, he instead averaged that 27.12 – and this included three sizeable centuries. Strange selections have rarely been unusual to England, so Vaughan was thus rewarded for his going backwards where everyone expected big strides forwards with a full England tour of South Africa. On that tour, batting at four, he showed further signs that any good judge could recognise of his potential (never more so than with a level-headed 33 which rose from a scoreboard of 2 for 4 in his inaugural Test innings), but also why it was that he was yet to fulfill it. Lip-smacking cover-drives and judicious leaves were merely the two biggest pieces of his puzzle – he was capable of playing virtually every shot in the book. But too often an error of judgement would creep in, whether that would be misjudgement of which ball to attack, failure to pick the correct line, or over-ambition against good-length balls. A year later and matters had barely changed – Vaughan had lost his Test place on a couple of occasions due to injury but upon regaining it it was still the same story on both occasions – promise nipped in the bud. Even so, some of his relatively small innings’ were invaluable as second-fiddle-player acts. A second-innings 41 on a bouncy, seaming deck at Lord’s against West Indies in 2000 would turn-out to be one of his finest hours, and it (and his partnership with Michael Atherton, a man to whom he was at one point compared) played a massive part in an unspeakably vital England victory (one which turned the tide of a series that ended-up in England’s first Wisden Trophy victory for 31 years). A little-noticed first-innings 26 in another low-scoring game on a pitch which offered plenty to seam and spin at Sinhalese Sports Club in Colombo in 2000/01 (and his partnership with Graham Thorpe) again played a crucial part in a crucial (this time series-deciding) victory. And in 2000 Vaughan finally attained the sort of level of performance that Yorkshire fans had been expecting for a little while – when he found time to play for them in the four seasons 2000-2003, he averaged 50.26. 2001 was a year of interrupted promise for Vaughan at the top level. At the start of the home summer he was pushed up to number three against Pakistan and responded by averaging 55.33 in the two-Test rubber. But a hand injury meant he missed the entire Ashes series, and in India in 2001/02 an extra all-rounder was initially preferred, then when he got back in (again at four) after Thorpe returned home with family issues he was twice the victim of Umpiring misjudgements (the latter in an incredibly bizarre instance where he was given out handled-the-ball after attempting to return it to the fielding side) but still managed to average 53. Quite why, with a settled top five in the bag at the end of that India tour (Mark Butcher, Marcus Trescothick, captain Hussain, Vaughan and Mark Ramprakash) the selectors again elected for some upheaval in New Zealand early in 2002 is once more anyone’s guess. But Vaughan was pushed up to open for the first time in Tests, and a pattern was established immediately. He would occasionally be dismissed by a good one very early, but mostly race to 20, 30 or 40 then give an easy chance. In New Zealand these chances were accepted; in the summer of 2002 against Sri Lanka and India they were not, and Vaughan punished the fielders mercilessly. Dropped on 28 and 32 in the second-innings of the First Test against Sri Lanka, he finished with 115; dropped on 50 in the second-innings of the First Test against India, he finished with 100; dropped on 19 in the Second Test, he finished with 197. And in the first-innings of the Second Test in Australia in 2002/03 he appeared to be caught at cover on 19 but was let-off by the television Umpire and ended with 177. In between times, he produced near-faultless innings’ of 195 in the Fourth Test against India (and an ominous 47* in the second-innings before rain curtailed proceedings); second-innings’ of 145 and 183 in the Fourth and Fifth Tests in Australia; and 156 in the first-innings of the First Test against South Africa in 2003. The end of the 2002/03 winter saw Hussain, who had ascended to the captaincy following the debacle of the 1999 World Cup, relinquish the ODI leadership and retire from the shorter format, reasoning – sensibly enough – that he would not be around for the 2007 event. Mistakes by England selectors in the shorter game have tended to come with even more regularity than in the longer, and most common in the causes has been an infuriating tendency to fail to distinguish between the formats and insist that anyone who can perform at Test level must also be able to perform at ODI. Vaughan’s initial ODI call – in Sri Lanka in 2000/01 – came because Hussain had to return home prematurely, but his elevation ahead of England’s finest ODI batsman of modern times (arguably ever), Nick Knight, for the opening two games of the series came close to beggaring belief. These games were the start of another two-year sequence: up to the end of the 2002/03 Cup, Vaughan played 26 of England’s 49 ODIs, averaging 23.50. Not, you might think, the sort of material that recommends one to captaincy. Well, once more, England’s selectors disagreed. Vaughan was awarded the ODI captaincy for the summer of 2003 essentially on the back of the Test scorebooks of the past year. Now came one of those times where fortune conspires to produce something that hindsight makes seem destiny all along. 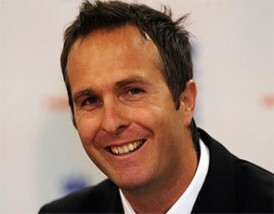 It is true that Vaughan had been viewed as potential England captaincy material for a long time, but had the ODI summer of 2003 gone badly (as it could and perhaps should have, with a weak England team taking-on the powerful Pakistanis and South Africans, as well as the less glorious Zimbabweans) then these ideas could easily have been rapidly revised. Instead, England outplayed both of these faltering sides, and within a single Test Hussain had sensed a change of mood (as well as his own deteriorating mental and physical health due to the pressures of captaincy) and handed over to Vaughan in the longer game too. The initial forays swung wildly from one extreme to the other, both in the remaining four Tests against South Africa then the winter’s first serious engagement in Sri Lanka (England lost two emphatic defeats and won two emphatic victories in the former, while in the latter they managed two remarkable escapes – the latter of which owed much to Vaughan’s batting – then suffered one ignominious thrashing). But in the Caribbean early in 2004 a new dawn broke for the England Test team, and Vaughan’s leadership was a part of this. Innovative when he needed to be (and conventional when the situation demanded convention – which was most times); always composed; always sensitive to his players’ needs and aware of how to get the best from them; and forging an equally strong bond with the coach Duncan Fletcher as Hussain had enjoyed, he established himself as England’s leader and he and the team continued to demonstrate a new-found ability to keep on and on winning against weaker sides than themselves. His skill and resilience now required a test at the highest level of Test cricket, and in South Africa in 2004/05 and against Australia in 2005 this was presented, and Vaughan passed with flying colours, as did his team. The sight of Vaughan standing, his team in happy embrace around him, raising the Waterford Crystal Trophy before a packed Oval with confetti and champagne flying all around, is an image that no-one who witnessed it will ever forget. By that time Vaughan’s stint opening the batting had been terminated, not by any realisation that it was not working-out (once the good fortune of 2002 had dried-up his racing to 20 or 30 then giving a chance became an issue that everyone noticed), but by another chance circumstance. A tweak to his knee, as well as being a worrying sign of recurring problems in that area (he confessed in a newspaper interview in early 2003 that “I love football, but my knees would never have allowed it [a career there]”), meant Andrew Strauss replaced him – initially, it was thought, for a single game. But Strauss’ stunning performances on debut convinced Hussain to retire, so Vaughan was back to the number-four slot for the first time since India in 2001/02, which now seemed almost a lifetime ago. And in that 2004 summer it seemed he might have finally broken through and begun to deliver on the promise of those last two series before he was thrust up to open. Alas, it proved not to be, and Vaughan mostly struggled in 2004/05 and 2005 with the willow. In 2005/06 his knee again caused trouble, and neither of his two appearances in Pakistan (the latter once again as an opener as Strauss went home early) convinced much. And when he was unable to play in India the seriousness of the matter truly hit home. He barely appeared for Yorkshire in the summer of 2006, missed the entire 2006/07 Ashes and increasingly confronted the reality that his playing days might be over – as did England fans. He came back in the ODIs that formed the second part of 2006/07, but neither he nor the team ever really hinted at overcoming their one-day shortcomings. Vaughan’s final ODI came against West Indies at the end of the 2007 World Cup, and it was ironic that his last innings, 79 (ended by a run-out), was one of his finest in the format. Against serious opposition, Vaughan’s 67-match career produced an average of just 24.55. For Yorkshire his one-day performances did improve marginally as his career wore-on, but his final List-A average for them was a mere 30.03. How much better everyone would have been had he never played a ODI. Some found it difficult to explain his lack of success, reasoning that he scored quickly in Tests so why didn’t he do the same in ODIs? They failed to notice that Vaughan played in ODIs exactly as he did in Tests; the different rules, however, meant the methods – orthodox strokeplay along the ground, and a level head which meant that the not-inconsiderable number of fine strokes which went straight to fielders was greeted with a shrug and a vow to again play the next ball on its merits – produced slow 20s rather than fairly swift centuries. And on the relatively rare occasions when he tried to adjust, to play a game he was not familiar or comfortable with, he looked a fish completely out of water. These same people, incapable of differentiating between formats, confidently predicted that Vaughan was finished and could never again produce regular runs in Test matches after his ODI failures of 2006/07. That he proved such doubters so gloriously wrong in 2007 – when, batting three, he was somewhere near his very best once again against West Indies and India after missing the summer’s opener with an injured hand – would have been the highlight of his career had the 2005 Ashes gone the other way. Sadly, that 2007 summer, like the 2004 one, proved unsustainable. Inexplicably, Vaughan was again pushed up to open in 2007/08, and the failings which had mostly limited him in his previous stint were revealed to still be in full measure. And, aged 33 by the end of that winter, this time the damage could not be undone. Another poor summer in 2008, back at three, proved the final nail in his coffin, and he was unable to return to county cricket and demand his place back. For Yorkshire from 2004 to 2009, he averaged a mere 25.65. Vaughan and his predecessor Hussain had much in common, as well as much in which they were poles apart. Both were outstanding captains of England, fit to rank ahead of any of the modern era (arguably any ever) except the ubiquitous Mike Brearley. Their methods were totally different, but Hussain (in 2000 and 2000/01) and Vaughan (in 2004 and 2005) both enjoyed tremendous success with outstanding sides under them over very short periods. Both then had to endure some lengthy barren spells, where they had to make the best of constantly injury-disrupted squads. Both resigned, close to tears, directly after a Test at Edgbaston, having been crushed by South Africa’s Graeme Smith and Graeme Smith’s South Africa, as well as the burden of leading for five years a side always under tremendous media and public scrutiny. Both retired at a time when everyone still wondered whether they had more to give, because they themselves felt their time had come and did not want to hold back young players, with England and at their own counties. And both, in the end, accomplished less as Test batsmen than they might have done. Hussain, however, merely failed dismally over the course of a year; in the four years either side of it he did more or less exactly as most expected of him. Vaughan was a disappointment again and again, with only occasional brief periods of raising above. What might have happened had Vaughan never been asked to open in Test matches, never been called-up to ODIs, been picked for his Test debut at the best rather than worst possible time, gained the captaincy in calm and orderly circumstances rather than in a borderline-JKF moment, and not suffered the crippling knee injuries he did, can only be speculated on. Certainly, he was not the first to suffer for the whims of the England selectors, nor from a weak body, nor from the constant soap-opera-like nature of English cricket. But truly outstanding players have plenty of times had to go through these as well, and have come out the other side. In the end, Vaughan simply did not fully capitalise on his rare talent for batting. Indeed, there were times, when he was late on or played down the wrong line of yet another full ball, to lose his off stump yet again, that one had to question whether he was really quite as good as he always looked when he nailed that perfect cover-drive, or pulled a ball through straight mid-wicket from a bowler who most rarely even attempted the shot at. Fortunately, even though it is inevitable that these moments of head-shaking despair will feature, the overriding memories of the man will always be of 2005: whether it be being lifted aloft as he yelled his delight at the Andrew Flintoff-inspired victory at Edgbaston, or that famous shot of leading the celebrations at The Oval. And maybe with a few glimpses of his triumphant conquest of his knees and his doubters in 2007 thrown in for good measure. As disappointments go, Michael Paul Vaughan can be fairly content with his lot. He goes into retirement with the best wishes of near enough everyone who played with and against him, and a cricketer can have few higher compliments paid him than that.